Summary: Award-winning doc about Hurricane Katrina melds first person and third person perspectives into a taut 96 minutes that both captures the moment and provides the context. Aspiring rap artist Kimberly Rivers Roberts just happened to have a new camcorder with her as storm clouds started building over New Orleans, and that helped her to become “a witness to history,” making real to us lives we all held so cheaply before the catastrophe shamed the nation. A triumph of documentary filmmaking, sure to be a contender as ’09 Oscar buzz builds. However, the outstanding new doc Trouble the Water sent my mind in the opposite direction, all the way back to Shakespeare: “Some are born great; some achieve greatness, and some have greatness thrust upon them.” Back off, Shakespeare scholars: I know these words are used to mock the Malvolio character in Twelfth Night, but sometimes they actually fit, and this is one of those cases. Trouble the Water is the story of an aspiring rap artist named Kimberly Rivers Roberts who just happened to buy herself a cheap camcorder one day. According to the press kit, her intentions were totally mundane (“recording birthday parties and family moments”), although I suspect she had hopes of learning to use it professionally as well. But whatever she was thinking the day she bought it, the fact is that Kim had her camcorder at the ready just as storm clouds started building over New Orleans on August 28, 2005, and having the power to capture images of her reality helped turn Kim into Superwoman. In other words, the subject (namely Kim) changed her performance in response to the fact that she was suddenly an observer. Sitting comfortably in our theatre seats, we’re watching real lives in jeopardy. Even as she kept filming, Kim knew her survival was in doubt, and she was unsure if she would live long enough to save her footage. 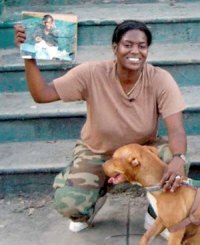 But Kim not only survived Hurricane Katrina, she became a source of inspiration and hope to everyone around her. Once the immediate crisis was over, post-Katrina chaos sapped the strength of most mortals, but Kim was relentless. She kept telling people about her treasure, and she kept filming, even as she and her husband Scott transported their small group of dependents to relative safety at a rural homestead. Meanwhile filmmakers Tia Lessin and Carl Deal had gone down to New Orleans with preconceived plans that were quickly abandoned. Tia had been one of the producers of Bowling for Columbine and Fahrenheit 9/11 (two of Michael Moore’s most financially and critically successful films), and Carl had managed all the archival footage on both films. Tia had also been one of the producers of The Awful Truth, Moore’s Emmy-nominated TV series. They weren’t looking for Kim, but when they met her they quickly recognized her as a working-class hero in the raw, and they knew they had the funding connections to go the distance. The finished product is a triumph of documentary filmmaking. It melds first-person and third-person perspectives into a taut 96 minutes that both captures the moment and provides the context. Critics and audiences are all applauding. Trouble the Water won the Grand Jury Prize at the 2008 Sundance Film Festival as well as three awards at North Carolina’s “Full Frame Documentary Film Festival” (the Full Frame/Working Films Award, the Jury Award, and The Kathleen Bryan Edwards Award for Human Rights). With its 96% Fresh score on Rotten Tomatoes.com, Trouble the Water is sure to be a contender as Oscar buzz builds. For sure Kim has earned her “15 minutes of fame,” and my hope is that she uses it to continue holding our nation’s feet to the fire. Ironically, Hurricane Katrina may well be the best thing that ever happened to Kim, but that’s only because we now know her as “a witness to history,” someone with the courage and stamina to speak out for all those whose lives were held so cheaply, not only during the catastrophe, but before it and after it as well. Photo credits: courtesy of Zeitgeist Films.